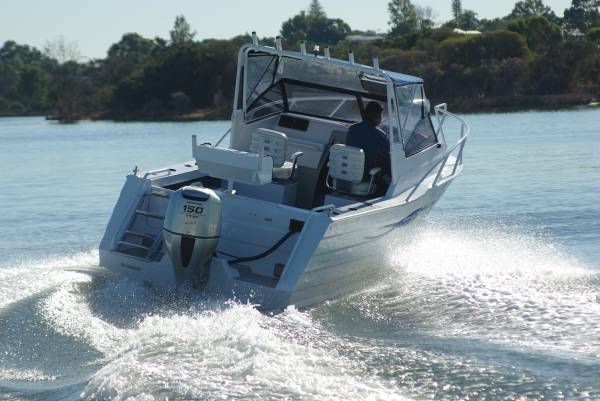 The Reef Hunter 630 is a beefy boat, both the bits you can see and gauge and those you can’t. The 4mm sides and 5mm bottom with all frames fully welded to it you have to take on trust, but clearly the sides are even stiffer due to the clinker pattern pressed into them. An indication of the builder’s expectation of rugged use is the 32mm diameter bow railing, well up on the usual size. Interesting, though, that bow rails on trailer boats get as much use as hip pockets in singlets. Some of the money saved by deleting them would install a more useful perimeter grab rail around the windscreen. 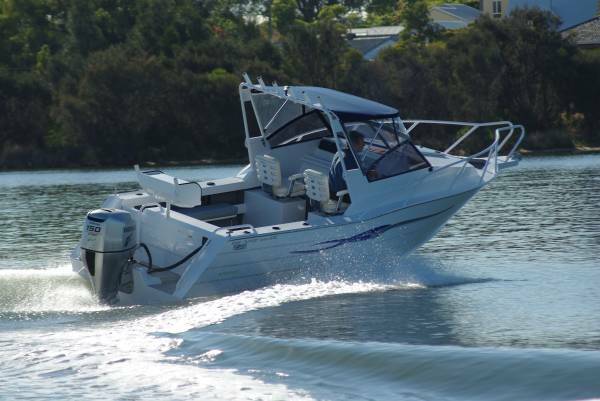 And a buyer could order that: this WA-built boat can have anything added or deleted and customised in any way. An advantage of buying local. Several things about the structure hit my eye. Where the inner edges of coamings are generally rolled into a U cross section, the Reef Hunter’s get one more wrap-around for additional rigidity. The side pockets and rear shelf similarly get plenty of attention, with full welding in the right places to make them burst-proof. The layout is cuddy cabin, meaning you do get a dinkum cabin but it is on the small side. With the infill in place it would be possible to sleep - with a slight bend in the spine - but more importantly it has the depth to take a chemical toilet. In cuddy style there is no rear bulkhead, but the agents had fitted a fabric bulkhead with zip up door for privacy. 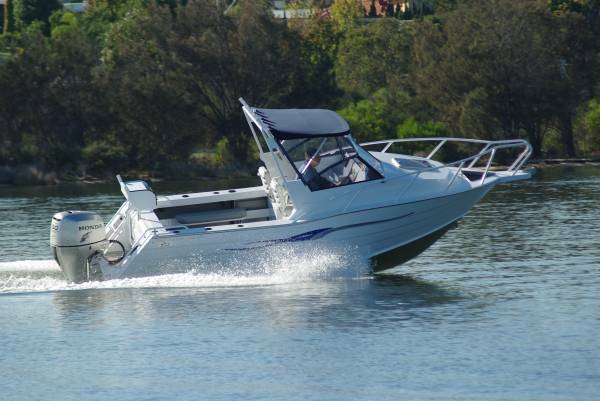 The large clear fore hatch gives ample light with the door zipped, and also gives the best access to the foredeck. There is no doubt that the 630 is intended for a mainly daylight role, with its extensive cockpit whose chief feature is emptiness. The two seats forward on cave lockers are the only permanent intrusion; there is a settee on board but this is removable, and is actually mobile. It hooks onto any part of the side pockets or rear shelf – justifying all that attention to strength. The underdeck kill tank is further forward than typical, which could be useful for reasons other than just housing catch. If faced with a long run into an unpleasant sea, flooding it could ballast the 630 down enough to soften the ride more than simply using the power trim would achieve. 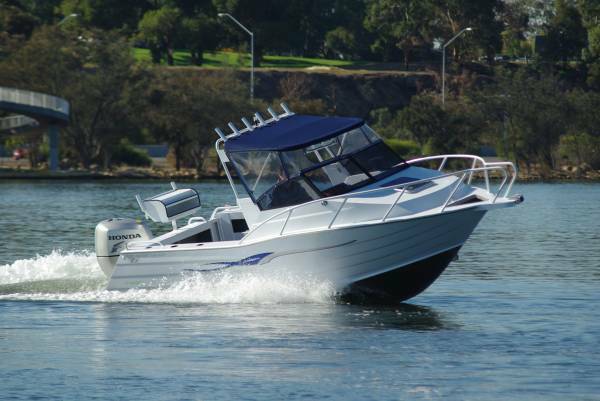 Other fishing items provided include a first class bait table at the transom, rod sockets in the coamings and a rank of them across the Targa arch. The heavy-duty arch folds not by undoing bolts, an action that will inevitably chip paint, but by simply lifting a Highfield-style clip on each leg. The Bimini it supports shades a useful share of the cockpit, and comes complete with clears containing a zip-out panel ahead of the driver. The driver gets literally an armchair ride in an up-market sliding and swivelling seat matching the navigator’s. The boxes these seats are mounted on extend right out to the sides (why don’t they all do this?) giving a huge storage volume. The driving position is good, with eye level well below the windscreen top when sitting and well above it standing. The dash has plenty of room for electronics, but in standard form carries just three analogue gauges: rev counter, trim gauge and fuel gauge – all of them items to consult frequently, and all with the very readable Honda white faces. Our matching Honda 150hp four-stroke was in good balance with the hull, getting us to 6000rpm in brisk time but also being willing to hold trolling speed apparently indefinitely. The controls had been well installed – which also indicated the builder had provided for lightly angled cable runs – and the mechanical steering in particular was light and smooth. A single battery comes standard, but its location encourages an owner to check it regularly: it is out in the open on the rear shelf. Doors on this boat have been pared to the minimum, with the sole survivor being the one leading to the boarding platform. This in turn leads to an excellent ladder, long, tough and with friendly treads. 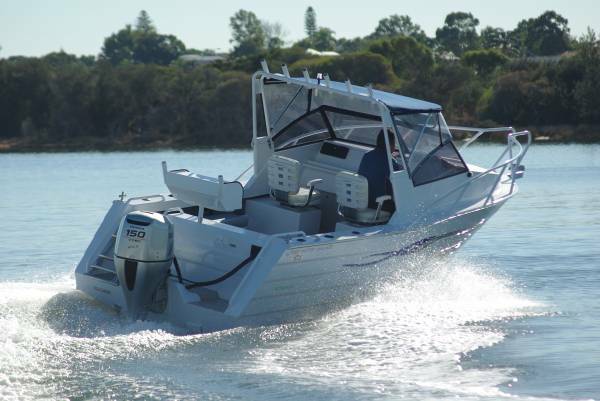 The Reef Hunter 630 is a thoughtfully designed and thoroughly equipped boat – it even gets a ski pole – sitting on a first class trailer. A neat package.